VIZ Media Announces "Dragon Ball: A Visual History"
Dragon Ball was a long-running Japanese manga series written and illustrated by Akira Toriyama. It was originally serialized in Weekly Shonen Jump from 1984 to 1995 and was comprised of 519 individual chapters. The hero of Dragon Ball was Son Goku, and the series began with the story of his childhood. Dragon Ball Super is a sequel to the Dragon Ball manga and the “Dragon Ball Z” anime series. Dragon Ball Super is set several months after Goku's victory that brought peace back to Earth. Goku and his friends must defend Earth, this time from fighters from another universe. Warriors from Universe 6 arrive and challenge the heroes of Universe 7 (Goku's universe) for control of Earth and its food. As Dragon Ball Super, Vol. 2 (Chapters 10 to 15; entitled The Winning Universe is Decided!) opens, Goku takes on Universe 6 fighter, Frost, and promptly loses. One after another, Goku's friends and colleagues fall to Frost. Is he that good a fighter? Or is there something else to his success? Plus, a familiar face arrives from the future to warn Goku and company. THE LOWDOWN: Thanks to my VIZ Media media representative, I am an occasional reader of Dragon Ball manga. I have also had the chance to read several manga by Dragon Ball creator, Akira Toriyama. My rep has been sending me copies of the Dragon Ball Super manga. 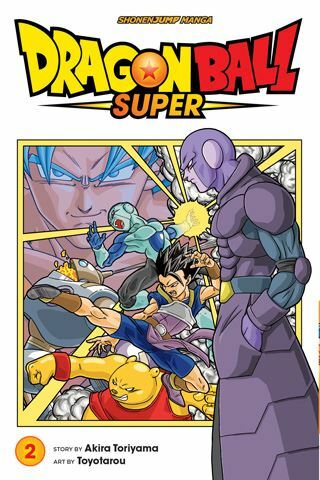 Dragon Ball Super Graphic Novel Volume 2 moves beyond its original premise – the fight between Universes 6 and 7. I must say that this is thoroughly a shonen manga fight comic, and the fight scenes are very well constructed, with the action in each panel being quite clear. The battle of universes is actually a nice read, but Vol. 2 really takes a strong turn when the next arc, the fix-the-past time travel story, begins. I READS YOU RECOMMENDS: Readers looking for more Dragon Ball will want to try the Shonen Jump title, Dragon Ball Super.